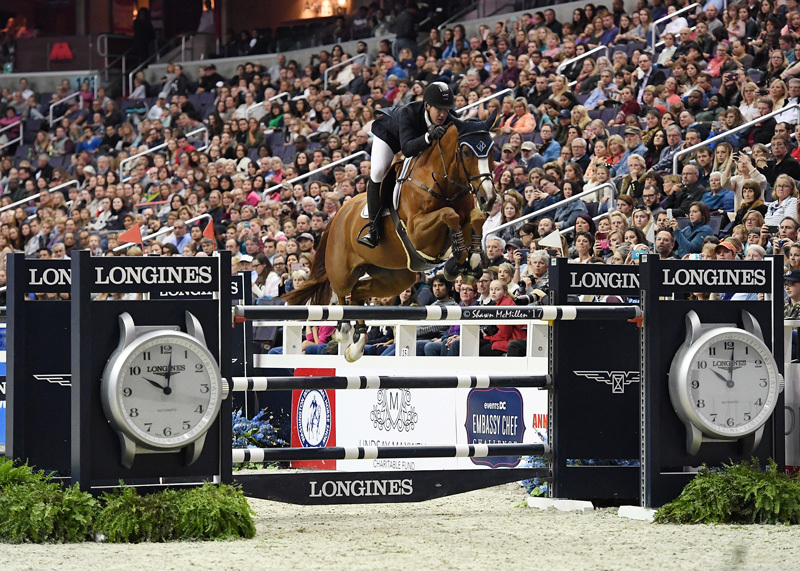 October 28, 2017 – Beat Mändli of Switzerland made his first visit to the Washington International Horse Show (WIHS) a successful one, claiming the victory in the $130,000 Longines FEI World Cup™ Jumping Washington, presented by Events DC, on Saturday night. Competing for the coveted President of the United States Perpetual Cup, donated by First Lady Jacqueline Kennedy, as well as valuable Longines FEI World Cup™ qualifying points, the grand prix was the highlight event of the week-long show, continuing through Sunday, at the Capital One Arena in downtown Washington, D.C.
Mändli was one of 26 international jumper competitors to contest the first round track set by course designer Alan Wade (IRL), and he and his mount Dsarie, owned by Grant Road Partners GmbH, were one of 11 combinations to advance to the jump-off. As the sixth to return, Mändli and the nine-year-old Dutch Warmblood mare set what proved to be an untouchable time of 32.07 seconds. 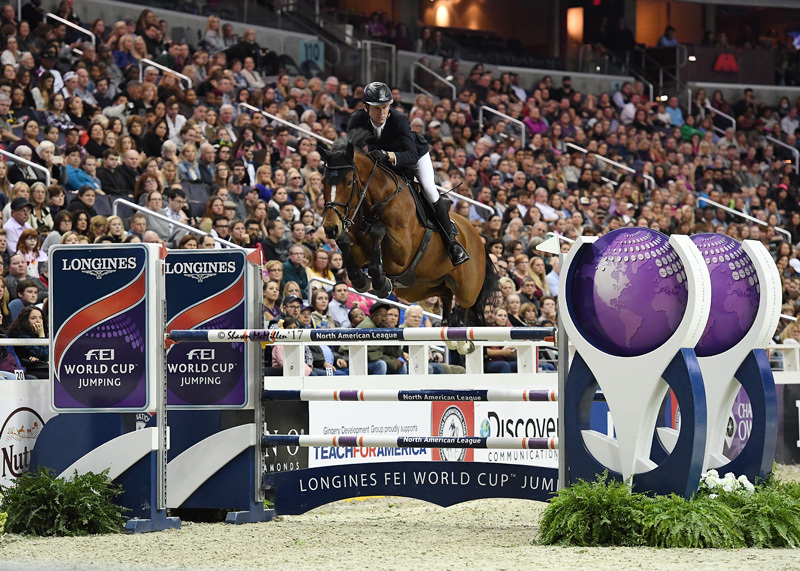 U.S. Olympian and reigning Longines FEI World Cup™ champion McLain Ward came the closest to besting Mändli, finishing in second aboard HH Callas, owned by Double H Farm, with a time of 32.30 seconds. Young U.S. rider Catherine Tyree, 23, rounded out the top three in a time of 33.83 seconds aboard Enjoy Louis, owned by Mary and Joseph Tyree. It was a good night for Ward as well, who only partnered with HH Callas, a ten-year-old warmblood mare, at the beginning of the 2017 show season. With 11 horses in the jump-off, the first-round course proved slightly easier than Alan Wade anticipated, but the course designer was still happy with the outcome. 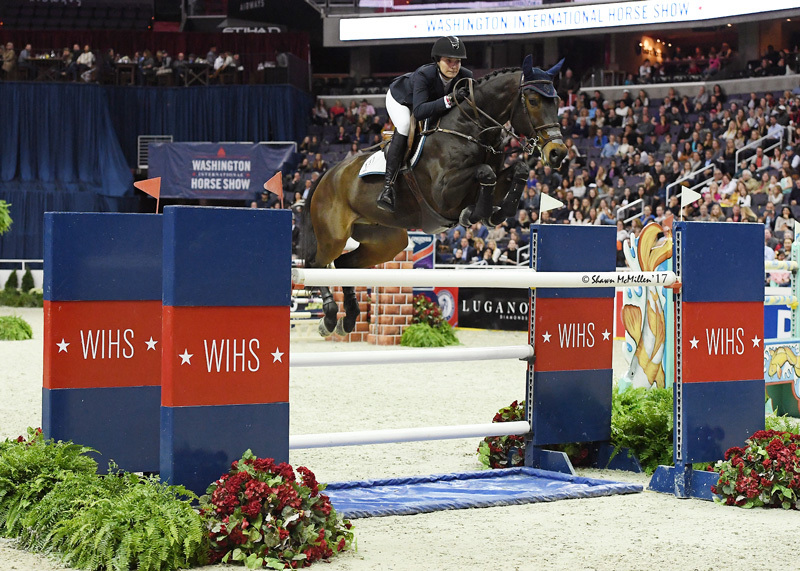 Part of the reason for the horses jumping well could be attributed to new footing installed in the Capital One Arena for the 2017 horse show, something that WIHS President Victoria Lowell spoke to following the class. 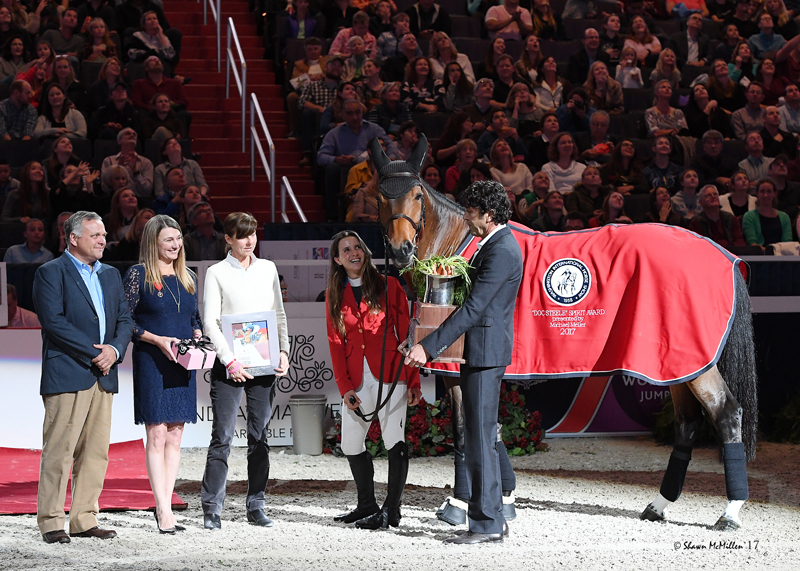 Following the conclusion of Saturday night’s class, several special awards were presented along with the top grand prix prizes. 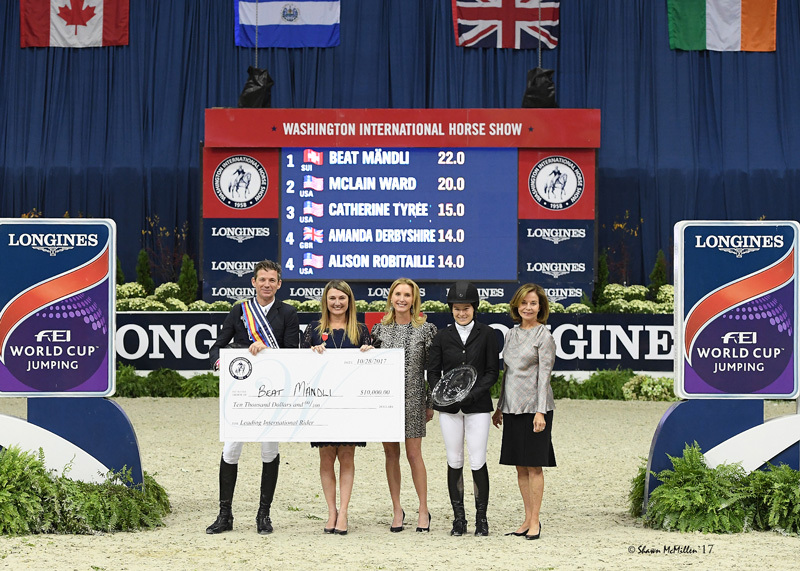 Mändli was presented with the $10,000 Leading International Rider Award, sponsored by Robin Parsky; the Leading Foreign Rider Award, and the International Jumper Championship. 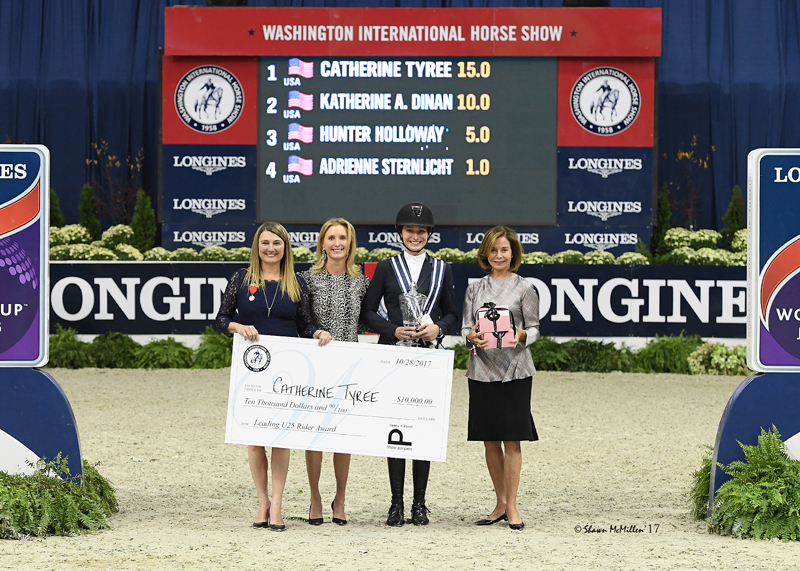 Tyree was awarded the $10,000 Leading 25 Years of Age & Under Award, sponsored by Sleepy P Ranch, and the Leading Lady Rider Award, sponsored by Longines. The Leading Jumper Owner Award went to Grant Road Partners. The George Morris Style of Riding Award was also presented earlier in the day to Mändli, as the International Jumper rider who best exemplifies the American style of equitation and jumping and the respectful, dignified, and workmanlike manner of a true sportsman. Newly introduced this year in honor of the late Dr. John Steele, the “Doc Steele” Spirit Award, presented by M. Michael Meller, went to Cristalline, ridden by Adrienne Sternlicht and owned by Gabrielle Kuna, recognized as the horse that best exemplifies the heart and athleticism necessary to be competitive at the highest levels of show jumping. 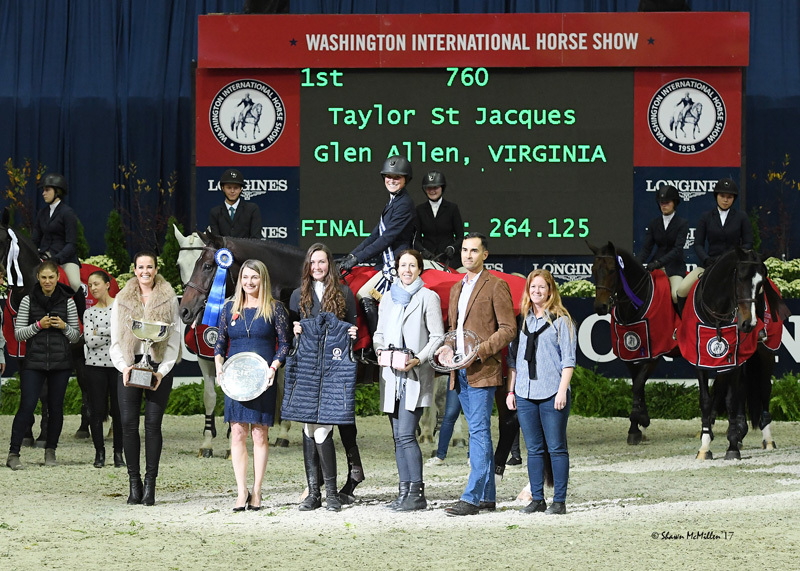 WASHINGTON, Oct. 28, 2017--The victory in the 2017 Lindsay Maxwell Charitable Fund WIHS Equitation Finals went to Taylor St. Jacques of Glen Allen, Va.
Forty of the nation’s top junior riders qualified to ride in this year’s final, competing first in a hunter phase on Friday and then in a jumper phase on Saturday afternoon. 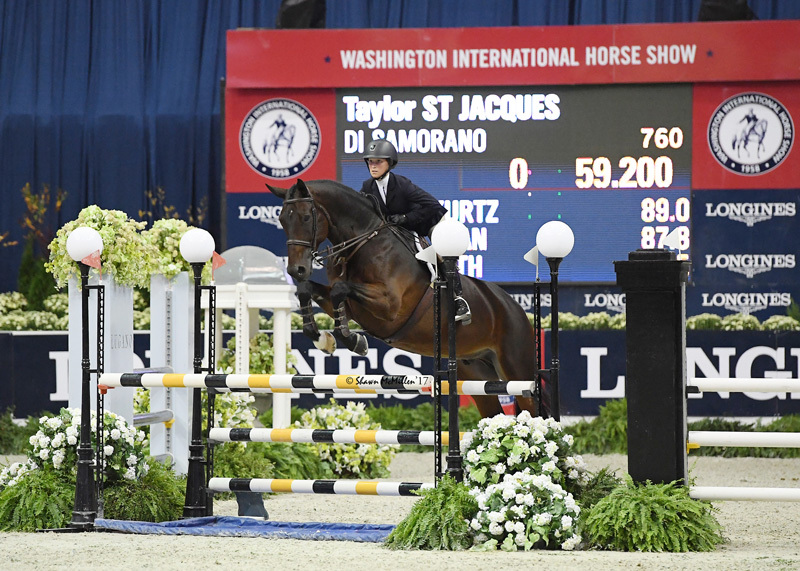 Riders’ average scores from the two rounds were combined, and the ten top-ranked competitors then swapped horses and returned for the final work-off phase on Saturday night. At the end of the first two rounds, St. Jacques sat in sixth place aboard her own Di Samorano, but an exceptional work-off round earned her scores of 94 and 92 aboard eventual ninth place winner, Annabel Rever’s mount Contigo 37. Going into the work-off phase, it was Ava Stearns of Chilmark, MA, who led through both the hunter and jumper phases, but an error in the opening line of her work-off would move her to the eventual sixth place position, leaving the window open for St. Jacques to take over the lead with an overall score of 264.125. Finishing in a close second with a score of 261.625 was McKayla Langmeier of East Granby, CT, riding Skyfall, owned by Linda Langmeier, and contesting the work-off round aboard Haley Redifer’s mount Vondel DH Z. Langmeier moved up from fourth to take the reserve honor, while Sam Walker of Nobleton, ON, moved from second to third to round out the top three with a score of 261.200 aboard Waldo, owned by North Run. For St. Jacques, 18, who came into Saturday night’s final phase fresh off a win in the Dover Saddlery/USEF Hunter Seat Medal Final at the Pennsylvania National Horse Show aboard Charisma, the WIHS Equitation Final victory felt extra special thanks to the horse she was mounted on. St. Jacques was presented with the WIHS Equitation Classic Trophy, donated by Mr. and Mrs. G. Ralph Ours, III, for her win, while the Lugano Memorial Trophy for the winning horse, donated by Stoney Hill, was awarded to Di Samorano. 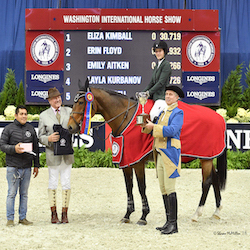 The 2017 Washington International Horse Show concludes on Sunday with the presentation of championship honors in the Pony Hunter divisions as well as the WIHS Pony Equitation Finals and WIHS Regional Finals, sponsored by The Linden Group at Morgan Stanley. Find full results of the 2017 Lindsay Maxwell Charitable Fund WIHS Equitation Finals here.